This excellent book is written by Giles Eyre, an experienced barrister and Lynden Alexander, a communication skills consultant. The book is well laid out; the topics are covered in a logical and easy to follow sequence. As you might expect, the earlier chapters look at the essential qualities of a medical expert and then move on to deal with opinion evidence both in general terms and more specifically in complex claims. 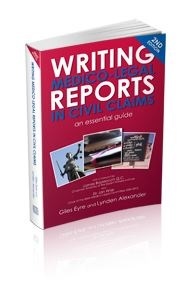 There are specific chapters on reporting in clinical negligence claims as well as addressing practical concerns in the expert witnesses practice with sections on cost budget-ing and maintaining the integrity of an expert witness practice. This book is in its second edition. It includes updates on recent case law including the Jackson Reforms and more recently the Montgomery ruling on consent and is recommended to lawyers and medical experts alike. New medico-legal experts will find the book particularly valuable, whilst the more experienced expert will find it at the very least, a helpful point of reference and update for their legal knowledge. The book also serves as a useful reminder to lawyers that good communication and engagement lies at the heart of the lawyer/expert relationship. The book is thorough and readable with useful templates for personal injury and clinical negligence practice. We particularly liked the “key-point summary” that appears at the end of each chapter. AvMA are pleased to recommend this well written, user friendly reference book.